Floor composition types for civic buildings, which SIRCONTEC company introduced a few years ago, find extensive application in many construction projects, including large multifunctional and residential buildings. PBG foam concrete (PBG cellular concrete) with self-levelling process is used for making levelling layers in these composition types. The main contribution of the levelling layer constructed in this way, is significant shortening of the placement time - in comparison with conventional procedures using board materials (polystyrene or mineral wool boards) – usually connected with reduced financial demands of the procurement. In comparison with using polystyrene or mineral fibre panels, PBG cellular concrete levelling layer is bound,stable and prevents formation of acoustic and thermal bridges. Forming a plane which substantially simplifies and accelerates application of further layers is a non-negligible advantage of PBG foam concrete levelling layer. This ensures constant thickness of the bearing layer (screed) in the entire surface of the room, which substantially improves the economy and contributes to reduction of cracks in this layer. 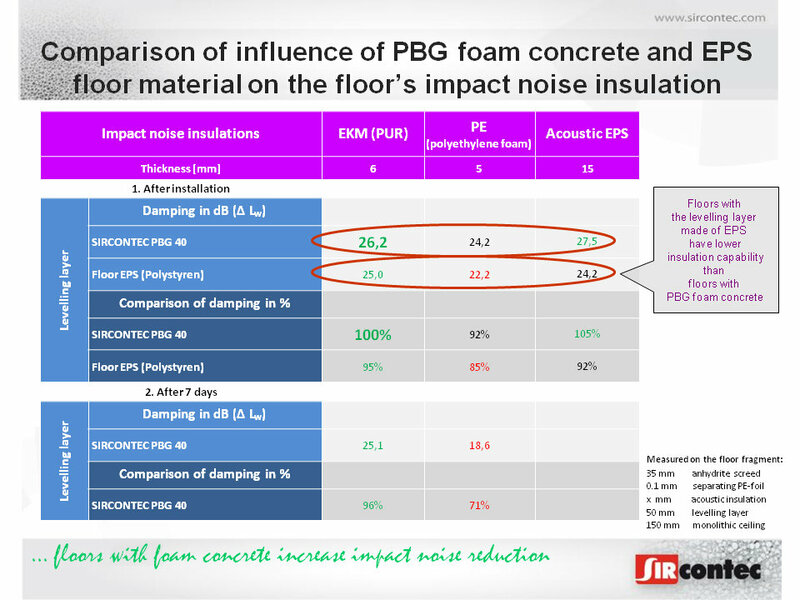 In comparison with the levelling layer made of EPS floor material in combination with acoustic insulation, the levelling layer made of PBG foam concrete significantly increases impact noise insulation properties of the floor, especially insulation of low frequencies. 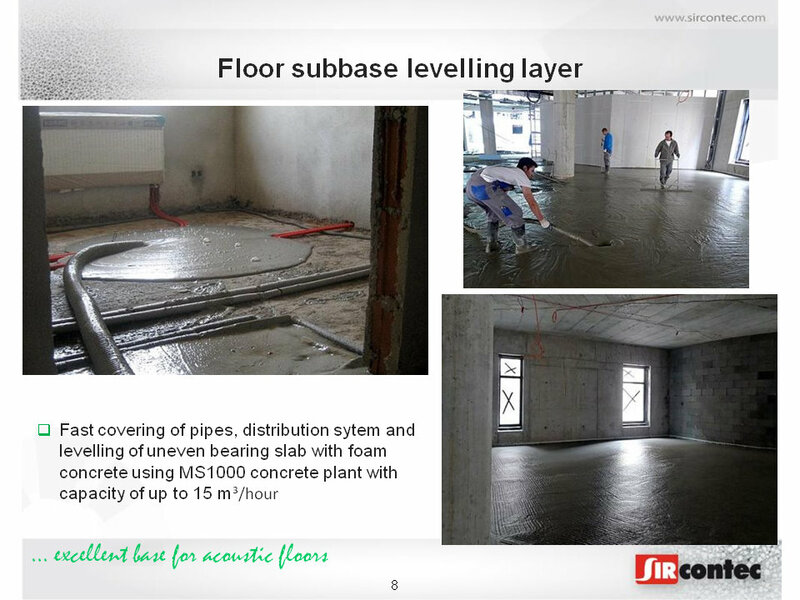 We provide to application companies a complete production and processing know-how including technological equipment of our own production for making cellular concrete (CLC) for SIRCONTEC floor system. This floor system has been realised on more than 1,4 milion square meters of floors in the territory of Slovakia, Czech Republic and Poland and it has been used for more than 10 years. Floors consisting of a structure containing noise insulation are designed for rooms specified in detail in STN EN ISO 717-1 and 2 standards. SIRCONTEC floor system employs an acoustic insulation to separate the PBG foam concrete levelling layer from the bearing layer (screed) / floor heating structure. Foam polyurethane – EKM fulfils the function of an acoustic insulation very reliably. The acoustic insulation is placed next to each other without overlapping. The surface of EKM will be covered with a PE-foil. Interconnection of the flexible pad with the peripheral flexible strip separating the screed from walls is a condition for its proper function. Thickness of the flexible pad depends on the wear layer type. From the point of view of noise insulation, the whole floor composition of a specified room is always assessed by an engineer authorised for the field of construction physics. Noise insulation values of various SIRCONTEC floor compositions depending on the wear layer type and the steel-concrete bearing slab thickness are described in DS No.207. In SIRCONTEC floors acoustic and thermal bridges are eliminated. The three main reasons why the acoustic floor is necessary, can be found here. Floors with SIRCONTEC PBG FOAM CONCRETE levelling layer and further layers which do not contain noise insulation are used in less demanding areas. Rooms with this floor composition should not be located above residential rooms in any case. SIRCONTEC always recommends separating a screed layer from the PBG foam concrete levelling layer. The separation should be carried out by using a PE-foil or a wax paper designed for this purpose. It is not recommended that the screed contacts the levelling layer. These SIRCONTEC floor structures are usually used in dwelling areas located above non-heated spaces or ground. PBG cellular concrete in this structure is used to cover installation pipes and for preparing a plane for simple and fast laying of a thermal insulation layer. Thickness of the thermal-insulation layer is to be determined by designer. It is recommended to apply a thermal insulation layer on the CLC layer immediately after it has achieved its walkable strength. This SIRCONTEC floor structures is used in dwelling areas located above both heated and non-heated spaces. SIRCONTEC PBG foam concrete in this structure is used to cover installation pipes. Designers determine whether also panel polystyrene is to be applied on this layer. The heating pipes can be, if necessary, anchored through a separating foil directly into the cellular concrete layer. If also panel polystyrene is incorporated in the structure, it is to be laid directly on the CLC layer and the separating layer is laid under the heating pipes which are subsequently embedded in heating screed with thickness prescribed by the screed material supplier. Illustration photos of making the complete floor structures can be seen in the Photo Gallery. Technical information on SIRCONTEC floors see below in Documents to download or in Download section. What applies for all floor compositions is that PBG cellular concrete layer should always be separated from masonry with a flexible strip and it should be laid in minimum 10 mm thickness above the upper level of the installation pipes. The separation with the flexible strip protects technological moisture from transition into the masonry and also contributes to decreased noise transfer to the walls.